I imagine for many, part of the fear comes from the level of expectation that they feel is required of them, and there may be some potential employers that might think students are not yet ready to take on such a challenge. However, after what has been a fairly successful self-employed placement year, I’ve come away with so much more than just the experience of setting up my own video production company. Therefore, having gained many useful skills that will undoubtedly assist me in my future broadcasting career, I now wonder if being self-employed is really so terrifying after all. As you can imagine, taking on a self-employed placement year wasn’t entirely my initial plan. It was a decision motivated by the desire to secure some sort of a work placement having failed to do so on numerous occasions with broadcasting companies. However, it was always a consideration as, at the time, I’d been working on my own brand to showcase my portfolio work - TotallyMedia. As well as that, I’d also completed a number of video projects for several clients during my second year. So, after putting together a plan for who I’d be working with and what the business would aim to achieve, I pitched the idea of a video production company to members of the University of Portsmouth’s Creative Careers service and nest. Needless to say, the idea was green-lit and my self-employed placement as TotallyMedia began. Of course, it didn’t take long before I hit a few hurdles. After the first few projects were completed, I realised that TotallyMedia didn’t really have a specific focus, making it very difficult to market and promote. Therefore, I decided to re-evaluate the company’s direction and turned to one of my biggest hobbies as a source of inspiration - basketball. Having played for a number of years, with some experience of sport-based video editing, I transformed TotallyMedia into a sports promotional video company and looked at working with specifically basketball organisations across the country. 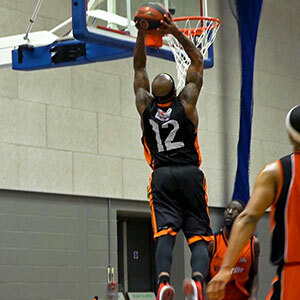 For example, I worked with Hoopsfix on the BBL (British Basketball League) weekly top 10 highlights videos for the 2017/18 season, and even got to film at the BBL Cup Finals in Birmingham and the Hoopsfix All-Star Classic in Brixton. I also travelled to the National Basketball Performance Centre in Manchester for the NBL (National Basketball League) Playoff Finals and Jr. Final Fours to film and produce highlight videos for Basketball England. By the end of the year, it became clear that the decision to focus the company on sports, mainly basketball, was a huge turning point in my placement year and lead to the production of more than 90 video projects. Upon reflection, going down the route of self-employment was a worthwhile and successful journey. TotallyMedia was not only recognised as a ‘Startup to Watch’ at the University of Portsmouth’s Enterprise Showcase but I was also able to put the company’s profits towards better camera equipment. Aside from tangible rewards, as an individual, I became far more organised with my work, and travelling to various events for filming meant I learned how to be confident and professional when meeting new people to best represent my business. However, there are several technical skills applicable to my university course that I’ve had the opportunity to develop including camera work, colour correction and the use of the Adobe Creative Cloud (specifically Premiere Pro and Photoshop). Having not originally focused on these skills, they will now prove to be extremely useful during my final year studying Television and Broadcasting. There were times throughout the year in which I wondered what might have been had I managed to land an internship with a broadcasting company in September. However, I now can’t imagine not doing a self-employed placement year as a result of the massive amount of progress I’ve made both with my company and as a videographer. So, to go back to my original question, ‘is being self-employed really that terrifying?’ the answer is simple. Yes. Yes it is. But I think, sometimes, it’s the things that scare us that are worth doing, for out of our comfort zone is where we truly thrive and grow.